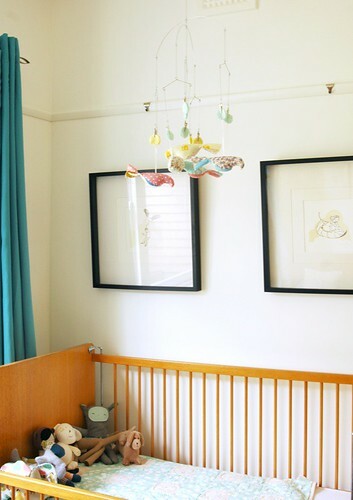 so in the days before mae was born i started scheming a mobile for the nursery. i finished a bunch of sweet fabric birds from the free spool pattern (except that i left the tails open and frayed the edges instead of sewing them shut because i liked the shape it created) and just had to figure out what i was going to attach them to. fast forward four odd months and we finally hung the mobile on sunday. i ended up just buying a kikkerland photo mobile to clip the birds into, it was the easiest option and i love the way it adds a bit of an industrial touch. there are ten clips and i've actually made ten birds but i didn't want it to be too overwhelming so i just used five for now, one bird for two clips. they do tend to get a wee bit tangled though and don't move around as much as i'd like so i think i'm going to rework it early next year and just use one bird per clip with a shorter ribbon to see how that looks and works. i'm just happy it's actually up there and that mae seems to like watching it - it feels so good to finally get this project off of my to do list! ah! i'm in love. it turned out perfectly. i love the extra touch of the turquiose and yellow circles. sweet dreams for baby mae. p.s. would you mind if i link to mae's birth story? i've been sharing birth stories all week on my lil' bloggie and would love to link to hers at the end of the week. I've had that pattern for awhile too and need to get on it with that lovely, vintage green fabric you sent me awhile back! I love your whole nursery. This mobile is gorgeous! Thanks for sharing the bird link. I just made my own with a photo mobile too, if you'd like a peek, it's over here. 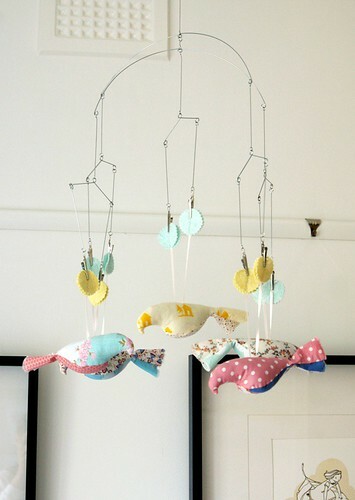 I made a mobile from this pattern too - oranges and blue's though. Although mine has been hung a while I am yet to blog it! Love the idea of the photo mobile, we used fishing line and a tree branch and balancing it was interesting! i found you quite by accident while googling around trying to learn how to print onto fabric. wish i'd found you before! it's so nice reading about all your crafty doings...i especially like the zakka-ness in the things you make. lovely quilt! and lovely birds! Leslie, It's gorgeous. 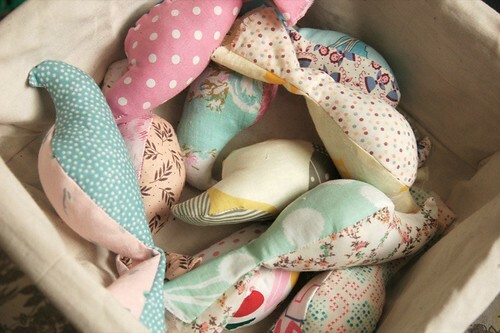 You're going to have me sewing birds now. I want one too. Is the mobile thingy from Ikea? Your mobile is fantastic. Love it. I love the kikkerland mobiles too. Versatile. Love it! I love your solution! I made this for my little girl and balancing the mobile was a total nightmare. Wish I would have thought of this.